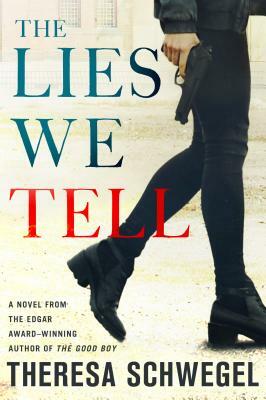 In THE LIES WE TELL by Theresa Schwegel, Chicago police detective Gina Simonetti is keeping a secret from the department: she has multiple sclerosis. Raising her young niece on her own, Gina hides her disease; she can’t afford to lose her job. Anyway, she is healthier than most of the cops she knows, and greatly appreciates the responsibility of caring for a child. But Gina's secret is threatened when a colleague calls her in to help trace a suspect: Johnny Marble has added to his rap sheet with an assault charge—this time against his mother. When Gina pays a visit to the mom in the hospital and winds up running into—and after—Marble, she finds herself in a physical confrontation she can’t possibly win. He gets away, and Gina is faced with an impossible situation. She has to find him, but knows doing so means turning in the one person who knows the true story of what happened. After all, now that he's seen her fight, Johnny Marble can reveal her deepest secret to the police department. Though alone in her struggle, Gina isn’t alone in her search: in addition to a loyal partner, there is a curious detective and an entire force of coworkers on the hunt. And she’s sympathetic to Marble’s mother, a woman who is losing her mind to Alzheimer’s. Still, Gina fears the fallout: she has no idea how will she keep her own world intact once Marble is found and the truth is out. Once again, Schwegel brings her remarkable talent to bear in this compelling crime novel about imperfect people struggling against all odds—and this time, against the very people who are supposed to help. Theresa Schwegel is a Loyola University graduate and the recipient of an MFA in screenwriting at Chapman University. Her debut novel, Officer Down, won the Edgar Award for Best First Novel and was short-listed for the Anthony Award. In 2008, she received the 21st Century Award from the Chicago Public Library Foundation. She lives in Chicago.